Get the latest insight on event management, leadership and the top issues affecting business leaders from D'Amelio Network's influential thought leaders. For every leader unsettled by rampant disruption, unbounded competition, relentless commodification, and the specter of automation, there is a powerful antidote already inside the organization: the untapped audacity, imagination, energy, resourcefulness, curiosity, eccentricity, and passion of its people. Those fundamental human qualities are the engine of the creative economy—the source of all value. And yet, too few organizations are designed to unleash, mobilize, and amplify that human edge. 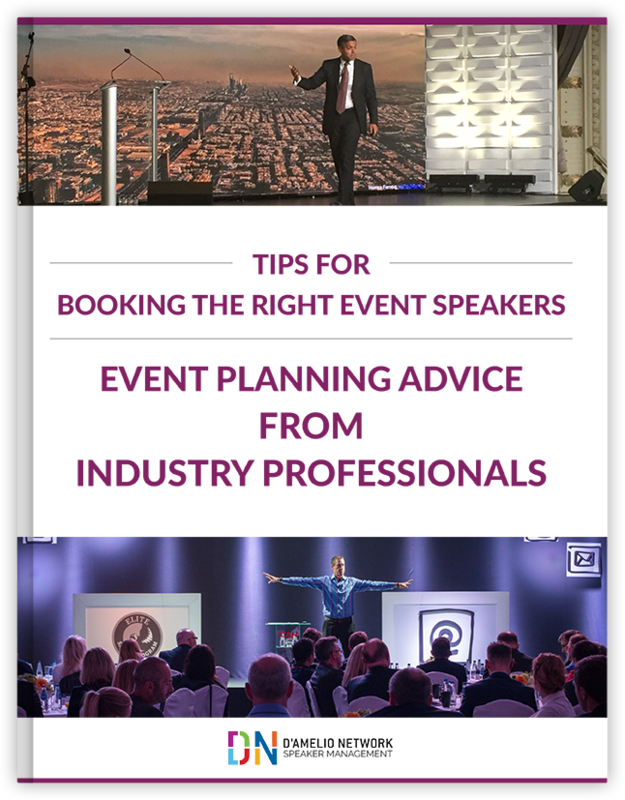 Discover the dos and don'ts of booking speakers. Learn best practices for achieving success with speakers with this expert insight. MIKE ABRASHOFF'S "NO-LIMITS MANAGEMENT" CREATES A CULTURE OF INNOVATION What organization isn’t searching for a path to inspire breakthrough performance by engaging the employees differently? If you’re among them, this story will inspire some fresh thinking on the subject. The natural reaction to the Wells Fargo debacle, perhaps within that company and by leaders at other companies looking to prevent similar behavior, is to clamp down and exert more rules and regulations; tighten organizational control. But Management Lab partner POLLY LaBARRE cautions that approach runs the risk of stifling the very innovation and employee engagement that organizations covet. Polly has been a top innovation speaker since her early days at Fast Company magazine; someone whose approach to organizational control was centered around the idea of unleashing the full power and creativity of the people within it by demolishing bureaucracy. Polly's strategies look to make organizations as human as the people who comprise them. I asked Polly to write about the tug between controlling, regulating, and making rules vs. the ideal of setting workers free to find new ways to drive innovation. I hope you enjoy her thoughts here on a fresh approach to organizational control. --------------------------------------------------------- Control by Other Means - The Benefits of Bureaucracy Without All the Costs by Polly LaBarre It was one of the most breathtakingly egregious cases of institutional overreach in recent memory: the widespread fraud uncovered at Wells Fargo last fall. Under bruising pressure to meet wildly aggressive sales targets, thousands of bankers created as many as 2 million accounts for customers without their consent—and kept the racket alive for years with a web of shady practices and tacit executive support. "DON’T LET WHAT YOU KNOW LIMIT WHAT YOU CAN IMAGINE" – FAST COMPANY CO-FOUNDER BILL TAYLOR Co-founder of Fast Company magazine Bill Taylor has had a front row seat at the very beginning of a revolution in management and competition driven by technology. While there he watched and profiled the mavericks and rule breakers who have achieved outsize success by taking a different path. Don’t Let What You Know Limit What You Can Imagine If you’ve been frustrated by the hard work of making organizational change happen in your company, you’re not alone. That’s why this interview with BILL TAYLOR, co-founder of Fast Company magazine, may be a compelling read for you. Beginning with his work at Fast Company, Bill had a front row seat to the revolution in management and competition driven by technology. He’s met and profiled the mavericks and rule breakers who have achieved outsize success by taking a different path. In his latest book, Simply Brilliant: How Great Organizations Do Ordinary Things in Extraordinary Ways, Bill gives his audience the best new examples of people and companies who are using groundbreaking new ideas and techniques to compete, innovate, and succeed. The book won many honors including “Best Strategy & Leadership Book of 2016” by 800CEORead. Read here as Bill and I discuss his book and the success stories he encountered in the process of writing it his book. THE HARD WORK OF DOING BIG CHANGE BILL TAYLOR has encouraged a generation of executives and company-builders to muster the courage and skills to think differently about change, leadership, and the new world of work. A spirited and hard-charging entrepreneur, Bill co-founded Fast Company, easily the most influential voice on business and innovation in the last two decades. The publication changed the very idea of what a business magazine could be. After the publication was sold for $340 million, Bill became on of the top speakers on managing disruptive change – helping organizations and leaders understand how to adapt to, and take advantage of, the relentless pace of radical change and disruption. INTRODUCTION: Consultant and author Polly LaBarre has a brilliant way of creating actionable steps to address complex challenges leaders in organizations face. In this commentary, Polly offers strategies leaders can use to ramp up experimentation that leads to breakthrough innovations. To learn more about Polly LaBarre and watch videos from past speeches, click here. Smart technology has drastically altered how we operate in everyday life, and the workplace is no exception. These technological advancements have contributed significantly to how businesses operate both in the big picture and in day-to-day activities. With smart technology evolving at such a fast pace, what’s in store for the workplace of the future? Talking about business disruption is almost becoming a cliché. Upheaval is so prevalent that it’s become the norm. The bigger issue is how to find solid expertise to help you and your organization successfully navigate the different forms of disruption.